No.1 Lusignac was completed in 2009 despite complicated planning restrictions. It is the first house next to the mediaeval hill village of Lusignac with its walled chateau and Romanesque Church. 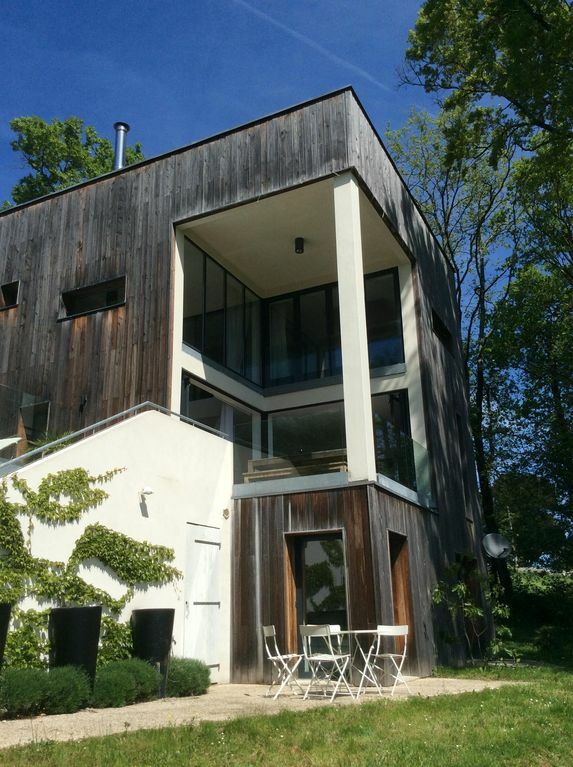 Its' owner is an English Architect who has been working in the Dordogne for 25 years. Unashamedly modern, it is built over three floors to take advantage of the stunning location and views across the valley. There are double height spaces, luxury kitchens and bathrooms, quality fixtures and furnishings, and a roof top solarium. Walls open up merging inside with out giving direct access to the terraces and pool. The house has not been designed and built to be commercially let out for holidays, so discerning, careful guests are invited to come and enjoy this wonderful home. I am an architect living in Gloucestershire but working in both the UK and France. I run my own practice and have diverse interests from sailing and water skiing to painting and drawing. I collect contemporary art and am most interested in modern Architecture of the 21st century. This house was designed for my own personal use, not for letting, so is much better equipped and to a higher standard, than most. I also run a boutique bed and breakfast in Cheltenham with just 3 rooms and a contemporary art gallery too! Hence, at the moment, I don't get to use my home as much as I would like! Please see the description of the house and its' special location in the main text. Bedroom 1 has an en-suite bathroom with wc, basin and bath with shower over. Bedroom 2 has en-suite shower room with walk in shower, wc, bidet and basin. Bedroom 3 and 4 share a full bathroom. There is also an additional cloakroom with wc and basin. The living room contains furniture by Ligne Rosset and the iconic 'peel chair' and footstool. The fireplace is by 'Focus'. There is a TV that receives most freeview British channels, a dvd player, cd player and a 42" flatscreen tv. Artwork is original. The Mobalpa kitchen includes fridge, freezer, dishwasher, steam oven, combination convection/microwave, coffee maker and induction hob.The worksurfaces are cream reconstituted stone. The washing machine is located in the ground floor bathroom. About 5 hours drive to the Pyrenees. 9 hole golf course about 6 miles. 18 holes at Angouleme or Perigueux. Notes on accommodation: The house has been designed over three floors. The ground floor also works well as a separate flat as it is self contained and has a further kitchenette with an extra fridge, hob and microwave. The four poster bedroom suite and study are on the top floor with access to the roof terrace from the study area. The entrance, living/kitchen/cloaks/terraces and pool are on the middle level with the other 3 bedrooms and bathrooms on the ground level. Outside: The house is constructed within a clearing of an oak wood on a steeply sloping site. The gardens are relatively small - you couldn't play football for example - but the views are splendid. The 12 x 3m horizon pool faces the view and is perfect for those early morning laps! The terracing around the house has been designed as a series of outside rooms, some covered, and some by the pool, Some timber decked, some paved and some 'big brother fake grass'! There are 2 bikes (may need to pump up the tyres) loungers, outside furniture, tables and chairs, parasols and garden lighting. The electric entrance gates give way to a macadam drive and ample parking for up to 4 cars. Utility Room: Washing machine. Cleaning / Towels / Linen / Maid service: Towels and linen are included. We ask that the house is left in a clean and tidy condition, but it will be checked and recleaned upon your departure and before your arrival. Other: There is a further study area overlooking the living room with books, games and the wifi internet access. What a great house in a great area! The views are amazing!Nice to meet the lovely owner . Our stay was as much about the garden as the stunning house. The electronic gate at the entrance worked a treat each time we used it, so any trepidation we may have had was unfounded. Three of us each had a bedroom, and all the beds were very comfortable. The kitchen and lounge were fully equipped so we wanted for nothing. We linked our laptop in to the CD via a two-to-one 3.5mm jack lead which we take everywhere, so were able to listen to our collection of music through quite a reasonable hi-fi system. The large TV, although not HD, was great for any English programmes you just couldn't miss, even on holiday! We made the ten minute scenic drive up to the boulangerie at Bertric-Buree for our baguettes, croissants and pain-a-raisins most days as there are no shops in Lusignac, just a bar restaurant. The croissants were enjoyed sitting outside the kitchen/living room area on the middle floor, which has a stunning view. For our first week, the temperatures were in the mid-thirties so it was lovely to cool off in the pool. With the pool being quite long, you could actually swim, rather than just splash about which was great to keep a little bit of fitness going. Now the garden. As having a very keen interest in natural history, especially butterflies, we contacted Nick (the owner), and asked if he could leave the grass uncut, so that any wild flowers would be there to attract butterflies for our photography. Nick duly obliged. This resulted in a count of thirty one species of butterfly just in the garden, with another five spotted whilst out on our travels. Non-British species included Scarce Swallowtail, Swallowtail, Pearly Heath, Mallow Skipper, Map, and the star of the show, Large Blue, which were extinct in Britain until being reintroduced recently. The grass areas aren't suitable whatsoever for lawn games due to the steep incline at the rear of the property and the layout of the front, but provided a fantastic environment for butterflies and other insects. This little area truly is a spectacular insect haven. This is without the Lavender hedge which runs down one side of the entire drive. No red squirrels, but we watched birds of prey circling as the farmer cut the field in the valley, and amongst other species of birds, there were a pair of Golden Orioles which flew by regularly. If you are looking for a modern house in an attractive location with lovely pool, lovely view and ridiculous number of butterflies, this is it! Thank you so much for such a great review. I am SO please that the wild flowers came through and you had such a wonderful time spotting and photographing all those butterflies. In the winter when the leaves are off the trees, it is much easier to see the red squirrels, deer and boar that sometimes wander through the garden. I am impressed that you managed the technology in the house...including the gates. They do at least guarantee that you are undisturbed! My next 'new' (and yet traditional) house is by the River Dronne in a beautiful village called Bonnes, near Aubeterre. As soon as it's finished, I'll send you details and you can spot river insects, dragonflies and no doubt more different species of butterflies. We had a wonderful stay and could not fault the property which was a joy to experience. The interior was spotless and modern, the kitchen was well equipped and easy to cook in, the open plan living and dining space relaxing and the bedrooms extremely comfortable. The views outside were truly beautiful and it was perfect to make use of the decking area for either sun bathing or eating outside not to mention the infinity pool for cooling down in. All in all a very relaxing stay. It has everything you need for a great holiday. What an amazing week in a stunning home. The house is exquisitely designed and the attention to detail is fantastic. The views are beautiful and the area so quiet and peaceful. I slept in one of the bedrooms on the ground floor and had the best night's sleep I've had for years...the mattress is heavenly. Not many people can lie in bed watching red squirrels leaping through the surrounding trees can they! The small kitchen area on the ground floor along with the 3 bedrooms and 2 bathrooms means the whole floor can be very separate and quiet if two families were to share the house. The middle floor is a great entertaining space with a spotless and very modern kitchen with dining/living area leading out to the garden and pool. It was a real treat to have the local bar/restaurant within a short walking distance. It's very easy to sit and enjoy the local wine! The one thing I hadn't bargained for was the abundance of wildlife, although with the roads being so quiet I suppose I shouldn't have been surprised. The red squirrels and deer can be seen from the balconies and fantastic infinity pool overlooking the valley. The cushions for the outdoor furniture are very comfy. Once again, there are various areas to sit/eat and enjoy the garden if different age groups or families stay here. So to sum it all up...a fab holiday home in beautiful surroundings 10/10. Ps. If you attempt the puzzle in the games cupboard...start it as soon as you arrive because it's tricky but irresistible! I'm so pleased that you enjoyed the whole experience of staying at No.1. It is a very special, unique house, with one of the most spectacular views. I love it too and wish I could spend more time in lovely Lusignac. Fabulous house on the edge of the village with magical views and absolute peace and privacy. We couldn't have had a better week. The house is beautifully designed, comfortable, cosy and really well equipped. It is a much loved home full of thoughtful pieces of art. The garden is cared for, the pool is warm and there are several areas to sit and gaze over the trees and fields. We were thrilled to see so much wildlife, so many wonderful birds, butterflies, red squirrel and deer around the house. We flew into Limoges which is a tiny and very easy airport to manage. Car hire is just outside the exit, the roads are blissfully empty and the drive to Lusignac was a pleasure. We didn't stray far from our haven, but found some lovely local restaurants, some magical walks and great croissants a stones throw away. We absolutely would love to visit the house again. River beaches can be found at the huge inland lake of Jamaye (25 min drive) or the river beaches of Aubeterre (20 mins) or St Aulaye (25 mins). The coastal beaches of Royan or Arcachon are about 2 hours drive. Use of a car is pretty essential. Fly to Bergerac (closest) or Bordeaux or Limoges. Lusignac is about a 6 hour drive from St Malo, 8 from Calais. The house is on the edge of Lusignac village but most shopping needs can be found in the villages of Verteillac or St Severin, both about 10 minutes away by car. Otherwise Riberac with its' famous Friday market, is about 20 minutes away. Angouleme/Perigueux are bothe about 40 minutes. Wonderful Bordeaux is 1.5 hours. There are chateaux, old towns such as Brantome/Bordeilles, vinyards, rivers and canoeing, tennis, microlight flying (the other side of Lusignac) and of course the gastronomy. Booking Notes: Please contact the owner for availability and a copy of the booking form. Full payment is required at the time of booking. The security deposit of £1000 per week can be paid by cheque, held by the owner, and returned within 2 weeks of your return to the UK assuming there have been no breakages/damage. Changeover Day: Changeover day is Saturday. We ask that you leave the house as soon as possible - around 9.30am, and don't arrive until after 4pm. Notes on prices: Prices are displayed in Pounds, but payment can be mae in Euros if preferred.